The artificial rumen techniques developed over the past five decades for investigation of rumen physiology as well as evaluation of feed rations, have ranged from batch fermentations to more complicated continuous incubations. In addition, the absorption function of the rumen wall has been included in some designs, in which a semi-permeable membrane is applied for removal of the fermentation end products. The most simplistic, in vitro fermentations representing the rumen were performed in different kinds of tubes (21-23). Another way to conduct a static, batch simulation is to use closed glass serum bottles. As an example, in the study of Lopez et al. (24) 0.2 g of diet (ground to pass through 1 mm screen) was weighed into the 120 ml serum bottles and the fermentation process started by dispensing 50 ml of strained, 1:4 (v/v) buffered rumen fluid under CO2 flushing. The bottles were sealed with butyl rubber stoppers and aluminium caps and incubated in a shaking water bath at +39°C. After 24-hour incubation, total gas production and pH were measured and samples for methane, hydrogen, and short chain fatty acid analysis taken. The durations of the reported batch fermentations employing rumen microbes have varied from six (25) to 96 hours (26) or even up to 168 hours (27). The buffer systems applied in batch simulations are quite often adopted from by Menke et al. (28), McDougall (29), or Goering and van Soest (30). Due to the fact that gas production has been used as an indirect measure of digestibility and fermentation kinetics of ruminant feeds, a scaled glass syringe (volume of 100-150 ml) has also been used as a fermentation vessel (28,37). The piston is allowed to move upward without restrain and thus indicates the amount of gas released due to microbial activity. The more sophisticated ways to measure gas production kinetics have been reported, for example the syringe/electronic pressure transducer-equipment (32), which measured and released the accumulated gas. However more automated systems were, both an apparatus which combined electronic pressure transducers and electric micro-valves (33) and the automated pressure evaluation system (APES) (34) where the overpressure was released by use of pressure sensitive switches and solenoid valves. Figure 6 A schematic diagram of semi-continuous Rusitec unit: driving shaft (S), sampling valve (V), gas-tight gland (G), flange (F), main reaction vessel (R), rumen fluid (L), perforated food container (C), nylon gauze bag (N), rigid tube (T), inlet of artificial saliva (I), outlet through overflow (O), line to gas-collection bag (M), vessel for collection of effluent (E). Source: From Ref. 35.
pressure in the gas space. The proper fermentation temperature was maintained by incubating the reaction vessel in water bath at 39°C during the experiment. The fermentation in Rusitec was started by placing solid rumen digesta in one nylon bag and an equal amount of feed to be used in a second nylon bag. The reaction vessel was filled up to overflow with strained diluted rumen contents. After 24 hours the inoculum bag was removed and replaced with a new bag of food. Removal of the oldest bag (48 hours) and adding a new bag was repeated each day. At the beginning of the experiment and during feeding, the gas space was flushed with the mixture of CO2 and N2 (5:95 v/v). The removed bag is drained, placed in a plastic bag and the solids washed twice with the artificial saliva. 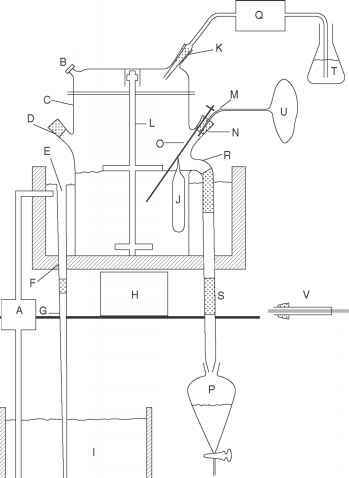 This rumination mimicking process includes gentle pressing of the solids and squeezing out excess liquid, which is combined and returned to the reaction vessel. The Rusitec technique has been quite widely applied as such. It has been used by a number of authors to study, for example, decreased methanogenesis (36,37) and efficiency of recovery of particle-associated microbes from ruminal digesta (38). In reported Rusitec studies at least up to 16 reaction vessels have been applied simultaneously (39). The running times of sample collection periods have exceeded from five (40) to 36 days (36) after stabilizing the microbial population for 12 hours (39) to 17 days (40). 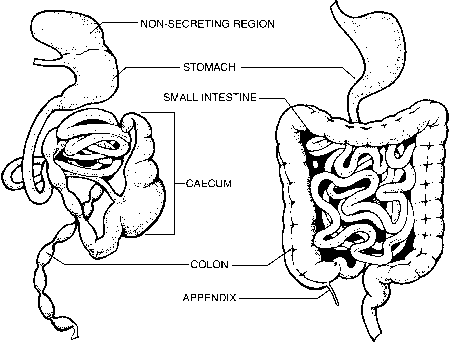 Figure 7 One of the earliest continuous culture systems for studying rumen fermentation. Source: From Ref. 41. Figure 8 A continuous culture apparatus providing absorption of fermentation products: centrifugal water pump (A), gas-sampling port (B), fermentor (C), feeding port (D), water-drainage pipe (E), Plexiglas reservoir (F), drainage tube (G), magnetic stirrer (H), water bath (I), dialysis sac with cation-exchange resin (J), saliva-inflow ground-glass joint (K), fermentor stirring device (L), gas-outlet tube (M), fermentor port (N), sampling glass tube and resin holder (O), liquid-effluent collection funnel (P), peristaltic pump (Q), effluent outlet (R), effluent rubber tubing (S), saliva-water reservoir (T), gas-collection bladder (U), feed-input apparatus (V). Ports D and N are shown 90° out of phase from their actual position to simplify the drawing. Source: From Ref. 44.
water insoluble substrates were continuously delivered to the vessel in the form of a slurry. One of the few devices taking the absorption of fermentation end products into account was developed by Rufener et al. (43) and improved by Slyter et al. (44). The apparatus (Fig. 8) consisted of six independent fermentation chambers (500 ml) with accessories providing anaerobiosis, constant volume, agitation of the fermentation mixture and collection of effluents and gases. For controlling the pH, this system included a dialysis bag containing a mixture of ion-exchange resins, which absorbed the short chain fatty acids. The fermentors were reported to reach the steady state in three to four days of operation. One criterion for this conclusion was the stabilization of protozoal numbers even though their density in the vessels was merely 2% of that found in the inoculum. 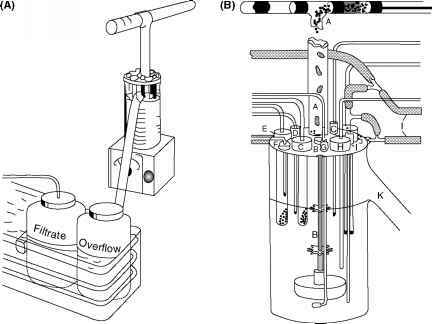 The dual flow continuous culture system described by Hoover et al. (45) and modified later by Crawford et al. (46) and Hannah et al. (47) simulates the differential flows of liquids and solids that occur in the rumen. In the design described by Hannah et al. (Fig. 9) (47), the mineral buffer solution (48) supplemented with urea is infused to maintain fixed liquid dilution rate, and solids retention is regulated by adjusting the ratio of the filtered to overflow effluent volumes using a filtering device. Temperature of the vessel is kept constant at + 39°C and pH is adjusted by infusion of 5N HCl or 5N NaOH. The vessel is constantly purged with N2 to preserve anaerobic conditions and mixing of the fermentation broth is performed with magnetic impeller system. The ground and pelleted diet is semi-continuously fed to the vessel in eight equal portions over the 24-hour period by use of an automated feeder. In typical experiments, durations of stabilization periods have varied from five to seven days followed by three-day effluent sampling period. Fermentation gases are neither collected nor analyzed from this simulation system. Depending on the experiment, systems consisting of four (49) to eight (50) glass vessels with a volume of 1.0 (49) to 1.26 liters (51) have been reported. 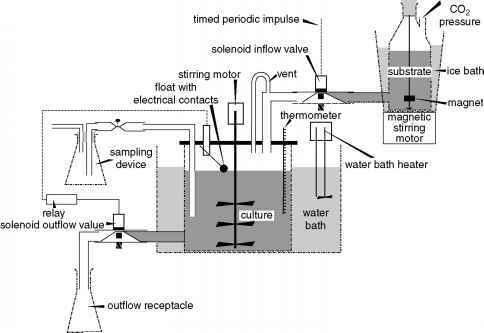 Figure 9 (A) General schematic of dual flow continuous culture system. 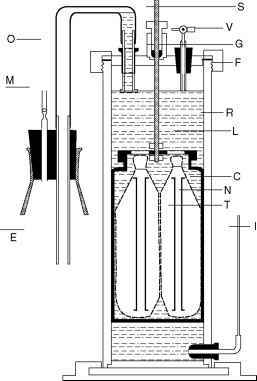 (B) Schematic of fermenter flask components. A, Automatic feeding device and feed input port; B, magnetic impeller assembly; C, sodium hydroxide infusion port; D, hydrochloric acid infusion port; E, filters; F, buffer infusion port; G, nitrogen sparger; H, thermocouple assembly; I, coaxial heat exchanger apparatus; J, pH electrode; K, overflow port. Source: From Ref. 47.